Rivers:- It is that time of year when the browns will start to make an apperance in the Eucumbene and Thredbo rivers as they run to spawn. While it may be a little early, reports suggest that there are a few fish doing their thing already. More rain is need for a fresh run of fish. Possibly later this week if we get some rain. 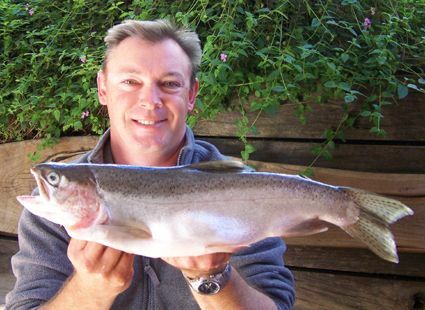 Lake Eucumbene:- The lake has been a little hit and miss but there are still enough of those fat rainbows around to keep most anglers happy. A few more browns have started to show though the rainbows are out numbering them considerably. The top end around Anglers Reach appears to be producing a few more of the browns. Seven Gates and Crowes area has been very good as has the whole Middilingbank arm. Spent a few days last week (4-8 May) camped up near the Thredbo River, fishing Lake Jindabyne. In 3 1/2 days early morning fishing mainly, I managed to hook-up to 19 fish, however, dropped 8 of them and released 1. 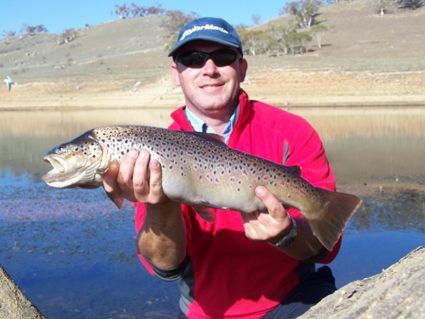 In my frustration at dropping so many fish, I managed to catch up with Chris (Maintenance at Snowline Caravan Park, Jindabyne) and outlined my dismay. He gave me a really handy pointer and put me onto the use of 2 single hooks tied together behind the tassies I was using. He suggested my drop rate was due to the treble hooks?? ?...........well I can say, I'm convinced the single lure hooks used with tassies actually work !!!! The action was pretty hot around Waste Point / Creel Bay area, and although I did do some early morning flatlining, virtually all my fish were caught on leadline (3 colours), using a Pink Bomber Tassie. Just before sunrise till about 9am was the peak period. 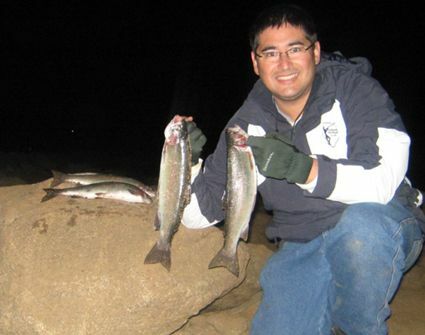 I went fishing at Kalkite from 4.30 to 9.30 pm last Saturday night and caught four rainbows, two on worm, one on chunky cheese gulp bait and one on lime twist powerbait.